On our 2nd day at the co-op's shop in Khon Kaen city, 2 members of the co-op arrive, children in tow, bearing metres and metres of luscious green, handwoven cotton fabric. Much to our delight, this unexpected visit gives us a chance to meet a couple of the younger members of the group and to learn more about the cloth we had been choosing when they arrive. Ploi (meaning "gem") is the younger daughter of one of Prae Pan's former shop staff. A weaver and dyer herself, she explains that most of the younger women are busy harvesting sugar cane. She and Noi (meaning "small") are dropping off cloth for older weavers, saving them a trip to the city. From Sooksamboon village, they are well versed in the use of natural dyes and we talk about which local materials were used to create the beautiful piece of mudmee fabric we are selecting for jackets. 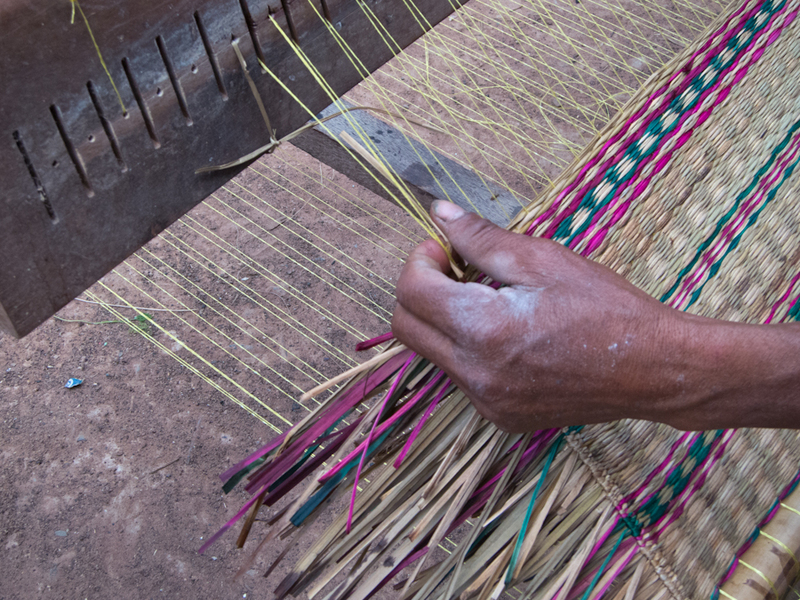 The younger weavers usually weave the heavier pieces, like the cotton lap blankets we buy this year, pictured below. As they prepare to leave, Alleson notices the credit union symbol on Ploi's knapsack. She wants to know more. We learn that Prae Pan set up a credit union about 10 years ago. Now with more than 500 members -- including weaving co-op members and others who live in the same villages -- the credit union has become an independent enterprise. It has bought land and is working toward erecting its own building next year. The credit union has helped people save money, offers life insurance and makes it easier for members to get loans without the same kinds of guarantees that banks typically demand. 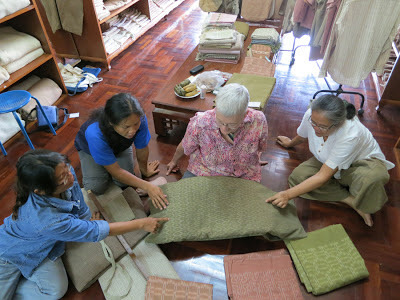 On day 4 of our visit, I have the chance to accompany Fon, one of Prae Pan's staff, and Pii Yai, a board member and good friend, to deliver our selected fabrics to the woman who will sew them into bags. 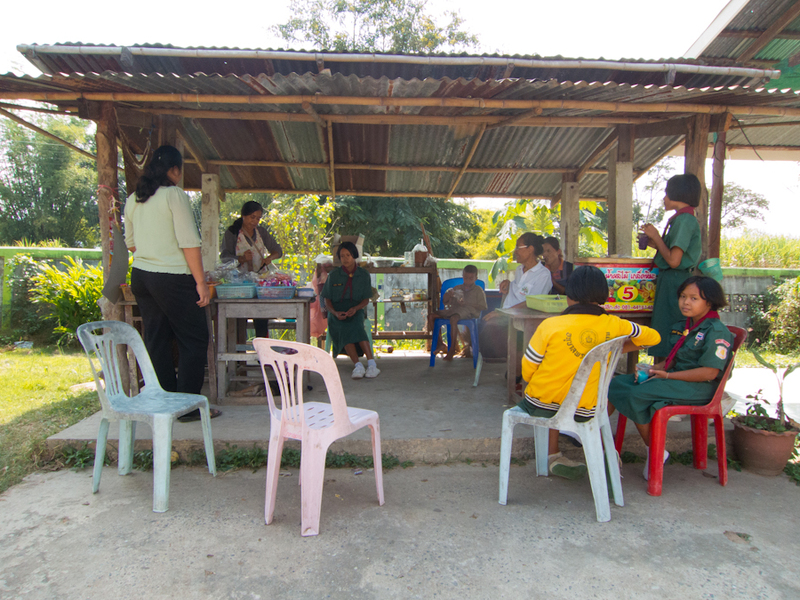 We drive to Nong No village, 50 km from the capital city of Khon Kaen. It's a sewing village. Throughout Thailand, one craft or other form of home-based work often dominates in a particular village -- weaving, pottery making, gong making, broom making and so on. Sewing employs many home-based workers in this village. The seamstress, Kampiang, sews only for Prae Pan. (That's where her heart is, I'm told.) TAMMACHAT customers know her work well, as all our bags from this co-op have passed through her skilled hands. Fon explains the details of our order for 2-pocket shoulder bags, and delivers the fabric, zippers and TAMMACHAT labels. I notice a couple weaving a grass mat in the yard next door. I ask if I can learn more. Soon Kampiang leads me through a narrow opening in the fence and introduces me to the man and woman working at the mat loom. 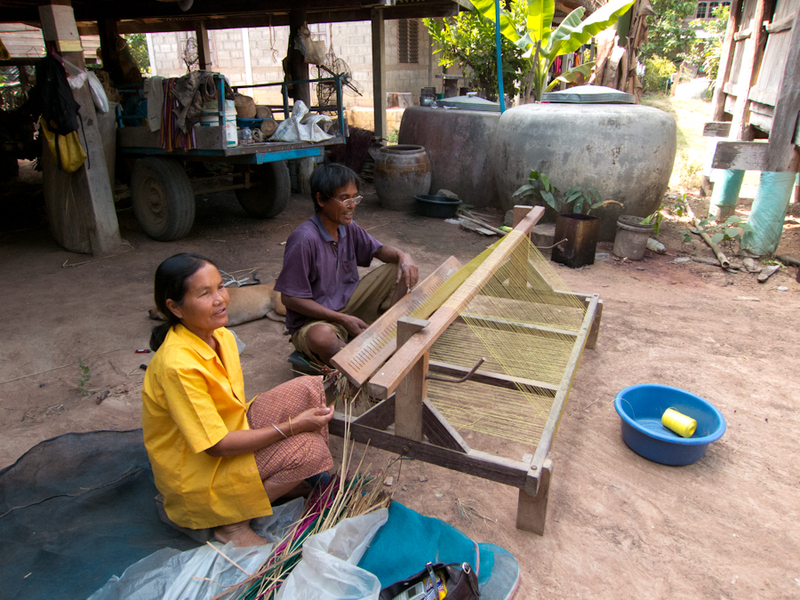 She deftly folds the end of a strip of grass over a stick and introduces it into one end of the loom. He slides it through, then pulls on the comb to tighten it as she prepares the next strip of grass, some of which she has already dyed. They work quickly and efficiently. Mats are still used here extensively within homes and even shops -- to cover an indoor tile floor before a sleeping mat is laid down, as a make-shift kitchen or eating area, to cover outdoor raised sitting/working platforms and more. This couple explains that they will be giving mats to other family members, as well as keeping some for their own use. 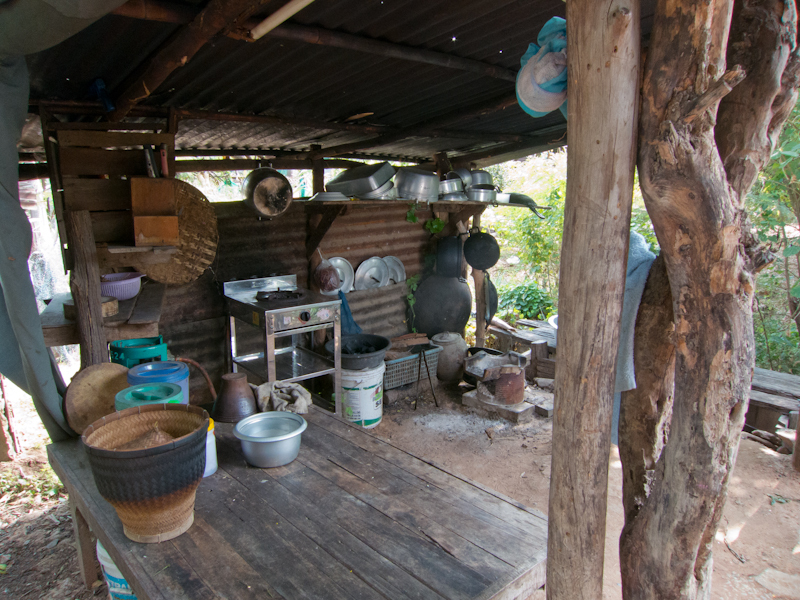 Before we leave, Pii Yai invites me to see the family kitchen, located to the left of the house. We had been sitting on a platform below the 2nd floor of the house and I had already admired the wooden building above. Kampiang's husband, a carpenter now working in Brunei to earn money for the secondary school education of their 2 sons, had built the house and the outdoor kitchen. 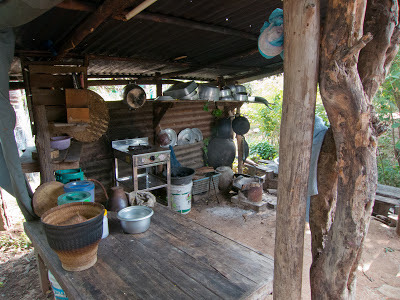 I've seen many such Thai kitchens and, like Pii Yai, was impressed with the organization and tidiness of this one. On visits like this, I never know what's coming next. Our final stop is at the village primary school. The kids are on a break and several gather at the small canteen next to the open air cafeteria. 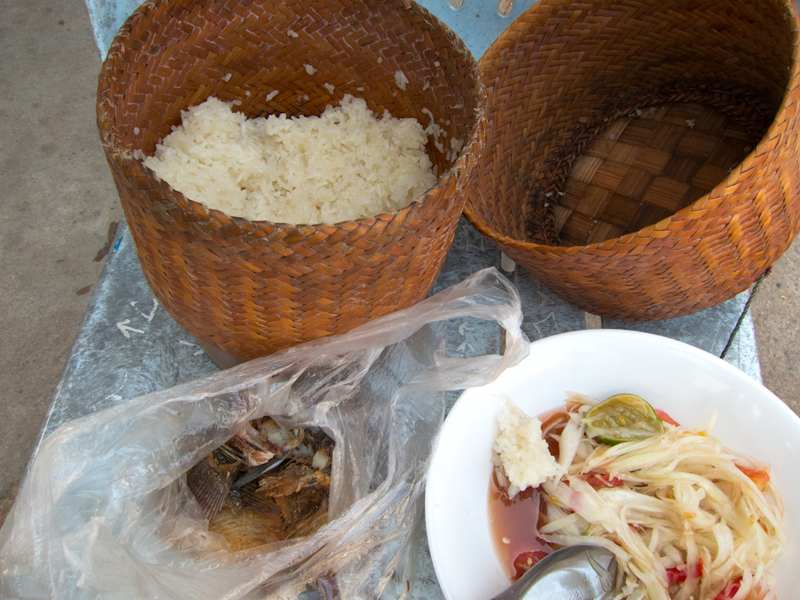 We enjoy a snack of som tom (green papaya salad), sticky rice and small, fried fish. I watch as the kids prepared for an afternoon meditation session before their next class. We arrive back at the shop in the late afternoon. In 2 weeks, our Prae Pan bags will be on a ship bound for Canada. The rest of our textiles are already en route with Thai Post. 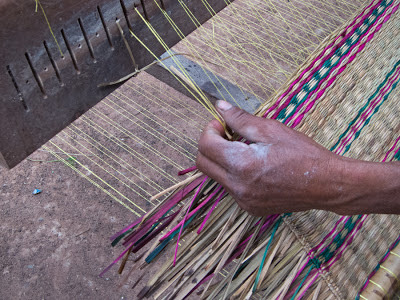 We always say goodbye fondly to everyone at Prae Pan, the 1st weaving group we met -- and the relationship that spawned TAMMACHAT Natural Textiles and is at the heart of fair trade.